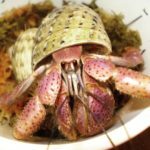 Recently had a power outage at the same time I have two hermit crabs molting (since Jan). Temps dropped to mid-50s despite everything I could think of to keep them warm. If I dig them up and by chance they survived, what is my next step since I interrupted their molt...thank you. I wouldn’t dig them up, they are doing fine as it is. Try to provide heat by using a space heater, wrapping towels and blankets, or using a desk lamp that gets warm. If the temp is back to normal, it is better to wait it out, nothing you could do now could help them. Not being disturbed is more important. If it is cold and you need to remove them to get them to heat, do so carefully! Have plastic containers ready with some substrate to isolate. Their tank was in the mid-50's for maybe a day or so last week. I had their tank wrapped up in blankets but it didn't help. Once heat came back on I was able to get their tank up to 80-81 degrees where it has maintained. I read some other posts that said in the 50's not good which I assumed. This is their first molt since changing out their substrate from Eco Earth coconut fiber to the Hermit Crab Patch sand. I don't know if that makes any difference whatsoever. Inherited them from my grandsons and I really love the little guys. I pray they survived. DJ went down @1st week Jan and Sharkey @mid Jan. Thank you for yr quick responses...new to the site. Sand holds temperature longer than other substrates, so it may not have gotten too cold. If they went down in January, they could be down well into May. Obviously it is your choice of what to do, but I would urge you to wait, at least a little while longer. When they are molting they can handle lower temperatures better since they are in a hibernation like state. My guys have have never been down for more than approx 2-2 1/2 months before that is why I was getting even more concerned. I am certainly going to take your advice and leave them alone...thx. Update - DJ came up from molting last night...doing well just missing Sharkey who has not come up yet. Hopefully Sharkey has survived the power outage also. Thx for everyone's support. It pays to listen to the pros. Yay!! If one is okay the other should be too. At the very least I would not worry about the temps causing problems. UPDATE - My Sharkey finally came up recently fm molting. So now they are both accounted for and are doing well. I have purchased a battery backup so hopefully if there is another power outage they should be ok. Thank you all for yr guidance and support. The best to all of you and yr babies. I'm glad it had a happy ending, and good thinking about the battery backup! Thank you both for everything. Again, it pays to listen to the pros. just a FYI - not sure what kind of battery backup you have but I have a APC for computer, which I did plug their ultratherm into, but it only lasted 2 hours before it died so unless you have a $500 unit or something it may not give you as many hours as you think.